Creation: VA 355 appeared as new primary routing between 2001-2003, running the way it does now. This is the 2nd VA 355. Comment: VA 355 does not appear on official maps and is located very close to the south end of the Warrenton bypass. VA 355 #1: Created in Oct 1947 (CTB) as new primary routing, running from VA 102 (now VA 177) Tyler Ave east through Radford College to US 11. 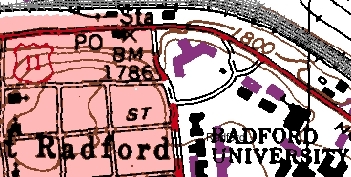 Radford College had been in line to receive mileage in July 1932 like other Virginia Universities, but nobody from the College came to claim it. Note that the road did not physically exist until at least 1950 as 1949 satellite imagery shows no road at all. In May 1983 (CTB), VA 355 was decommissioned because Radford destroyed it during a reconfiguration of their grounds between 1964-70 (satellite images). The precise location is hard to surmise from satellite views today but the topo map to the right shows how the road actually ran (but not labeled as any route and for some reason topos up through at least 2000 still show this road as being present). It is the road plus wye connection (explicitly mentioned in 1983 CTB) running from Tyler Ave (btw Downey and Grove Sts) along the west side of McConnell Library east to US 11 (US 11 was shifted north btw 2002-05 and until 2013 or so the US 11 alignment during VA 355's time was a parking lot). The only piece of 355 that looks to still exist is slightly south of the stoplight on US 11 where the access road to the library is.